As a quick follow up to the article on zeroing your iron sights, I wanted to share this video. It’s a USMC Primary Marksmanship Instructor teaching about zeroing the M16A2 rifle. 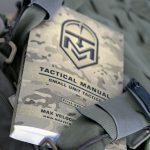 Most articles walk you through the basic steps of getting your iron sights zeroed, but they lack an explanation of why you’re doing the steps you’re doing. Let’s change that. After attending an Appleseed shoot in 2014, I was all hopped up on learning and preaching iron sights. I treated them like some kind of magic voodoo that I had learned, and that magic made me a real rifleman.